A few months ago Google Analytics released an awesome new feature – Custom Variables. My gut tells me that this is ONLY an issue with the interface and that internally the data is still being recorded, but I can’t know for sure. In any case it seems that from a functional standpoint creating more than 5 custom variables is fairly limited since currently you can only see the variable names and not the values for slots 6 and up. The above code sets the maximum number of custom variables to 10. I haven’t yet tested the limit of how many custom variables you can have, but keep in mind that Google Analytics has a limit of 2048 characters for the entire tracking request so there is a limit. Also, just a reminder that custom variables are limited to 64 characters in length for the name and the value. The “first_touch” custom variable in the screenshot above is set on a different page. Very cool thing that you found there. I wonder if that is going to be removed any time soon or will be available forever. I don’t work for Google so obviously I can’t say for sure, but from past experience, I highly doubt it will go away any time soon and I’m willing to bet it will still be there in a year from now. The cool thing is that even if they do decide to change the maximum number of custom variables in the future, whatever data is already in your Google Analytics account will still be there. I personally see this as the natural evolution of GA vs other variable’d WA solutions such as Omniture or YWA. The function has been in ga.js for a while now and I doubt they’ll remove it. Hope to see you and the gang in Mountain View this Fall! I’ve followed your blog and added another 4 custom variables to a site. 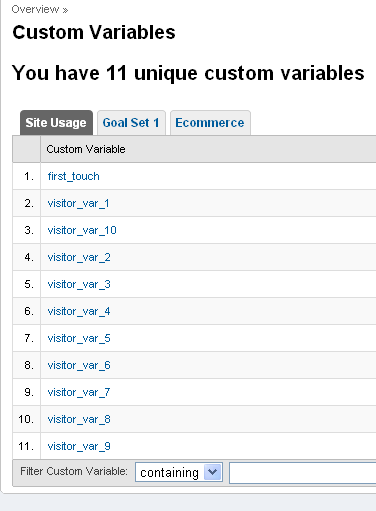 The problem is that now no custom variables show up in analytics! i’ve waited around 2 hours for it to pick the new variables. Do you know how long Google takes to respond to new Custom Variables? or have I done something wrong. Custom variable data can sometimes take a while to show up in your account. It’s usually within 24 hours, but I’ve seen a few instances where it was more like 36 hours. Keep in mind that you *will* see visit data *before* seeing custom variable data for the same time frame. I know this is very confusing but apparently the custom variable data is analyzed after the main visit data. Thanks for the advice. I was seeing the visitor data but not the custom variables. I wrongly assumed that if the visitor data was getting through then the custom variable data should be coming through at the same time. I want to point out that while you are able to get more than 5 custom variables, anything not in the first 5 slots are unable to be drilled down on. Great stuff Ophir and thanks for sharing. In the GA webinar on youtube it’s also been suggested that they will increase the number of custom vars at some point. I guess it’s just about making public what you have found out yourself already. Reminds me of the workaround to export more lines of data than the supposed limit of 500 rows. Yes, I’m guessing they’ll do something like what they did with the goals increase a while back. I just realized though that currently you can’t get the values for slots 6 and up in the interface, so the functionality is fairly limited for now. Is this still working for you, Ophir? I’ve checked my code with Firebug but the sixth _setCustomVar() doesn’t get sent with the other five. I’m using the async code, if that makes any difference. Yes, it’s still working for me, though I’m NOT using the async code. Thanks, Ophir. My data has just started to come into my GA account after 48 hours or so, but the sixth slot is not coming in. It appears that this does not work with the async GATC. I “only” use customvars in advanced segments and custom reports + API. Very interesting post and discussion, thanks guys. I’m still a little confused about whether there is a workaround to be able to implement and report on more than 5 custom variables. Are there any working workarounds out there or is there still the limitation of only being able to access the first 5 variables in the reporting interface? First off thanks for sharing this info with us! Just one question, are the custom variables over index 5 still usable as filters even though I cant “see” their values? How can I implement “pageTracker._setMaxCustomVariables(10);” with new GA versions? Just remember that you can only specify a maximum of 8 dimensions on queries to the Google Analytics Data API and that includes built-in ones like “source” and “medium”, so although you can set 10 or more, you can never retrieve them all in one valid data feed. My GOD thank you for this. It’s something that we have been having difficulties overcoming for a while, and seems like an elegant solution to the 5 custom variable limit. We’ll try it! How to overcome from limit on using 20 custom matric and dimension in google analytics?